Regardless of the type of consumer-focused business that you run, there is no greater truth than the old saying, location, location, location. Business owners who understand the value of signage all agree that a freestanding pylon sign can’t be rivaled for its effectiveness. Savvy business owners understand the importance of raising the visibility of their brand and maximizing the potential of their business with a strategically designed pylon sign. 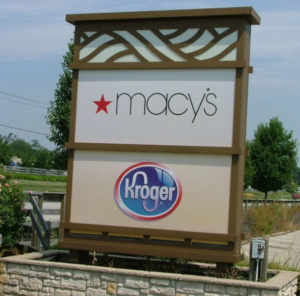 Not only can this eye-catching sign attract attention, but they are highly visible on any type of roadway! The simple truth is that if a sign can’t be seen from the road, passing drivers would have no idea that your business exists in the first place. From an advertising point of view, this is the crucial selling point of pylon signs. The freestanding signage can be placed near roadways or intersections easily because they don’t require any brick and mortar anchors. In addition to their effectiveness as a way to attract customers, they are extremely economical because of their one-time expenditure with very little costs after they are installed. Unlike billboards which can have recurring costs, pylon signs usually have a one-time installation fee. If the signage has electrical components, the sign may require yearly maintenance, but that is marginal in comparison to other types of signage! Pylon signs are durable and long-lasting. They are often fabricated using aluminum and steel. They can be either illuminated using fluorescent lamps or plain, unlit signage. They can be single-sided or have double-sided messaging to get your business noticed 24 hours a day. They can be easily customized with any colors, text or logos to complement your business’ identity. You can choose from popular choices like high-resolution graphics or vinyl lettering. Get your message across easily! Whether the sign is near or far away from your actual business, you can create an impact with a pylon sign to attract your desired audience & gain the business you’re looking for. Let ABC Signs help you understand that signage is the least expensive and most effective form of advertising. Pylon signs are a great way to advertise for any business, each and every day.